For your convenience we have bags in store or we stack 36 pre-packed bags on a pallet delivered. These individual bags are easy to carry and stack. One pallet of firewood produces the same heat output as 3.5 cubic metres of dry thrown firewood with the added bonus of no mess and no bugs. Using recycled geothermal energy from the Ohaaki Power Station, every piece of firewood has been professionally oven dried in specially modified geothermal timber drying kilns. 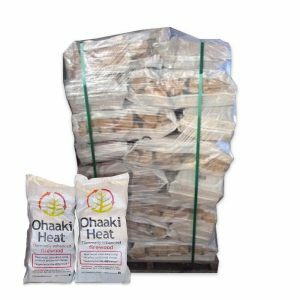 Advanced Geothermal Drying process Guarantees that every piece of Ohaaki Heat Firewood is dried to an average moisture content of 8%. Thermally enhancing the timber’s performance, producing a new and exciting firewood product that is guaranteed to light easily, burn cleaner and produce more heat. Real wood, oven dried using recycled geothermal energy, “experience the difference”. This firewood produces more heat than normal. For your convenience, we have bags available in store or we can supply 36 pre-packed bags on a pallet delivered. These individual bags are easy to carry and stack. One pallet of firewood produces the same heat output as 3.5 cubic metres of dry thrown firewood with the added bonus of no mess and no bugs. Delivery is to curbside or better if possible! PBT Transport will ring you before delivery to discuss delivery time and day, the ground must be flat and hard i.e tarseal, concrete. Concern is mounting around the amount of smoke and soot particulate matter being emitted by wood-burning fires around New Zealand, which is known to have adverse effects on health. Green or wet firewood is the major culprit in creating smoke that pollutes the air and creosote that clogs the chimney. 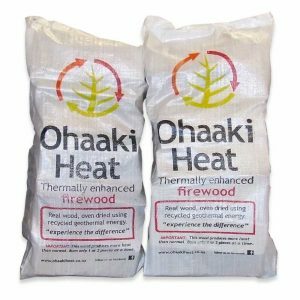 Ohaaki Heat is the driest natural firewood on the market, so it produces fewer emissions, low ash and much more heat. The result is a warmer house, cleaner chimney and a healthier environment. The oven drying process is also environmentally friendly, using hot waste water from Ohaaki Geothermal Power Station to heat the kilns, minimising the carbon footprint, making it the greenest, and best firewood on the market.